First let me announce that Mulder weighs 8 ounces! (The crowd goes wild!) AND Mulder is a boy! Apparently Jim is good at figuring out which ones are male. Might be because he is familiar with the equipment. He hasn’t done an exhaustive examination of all the kittens, but for now we think we should change Natasha’s name to Nate. 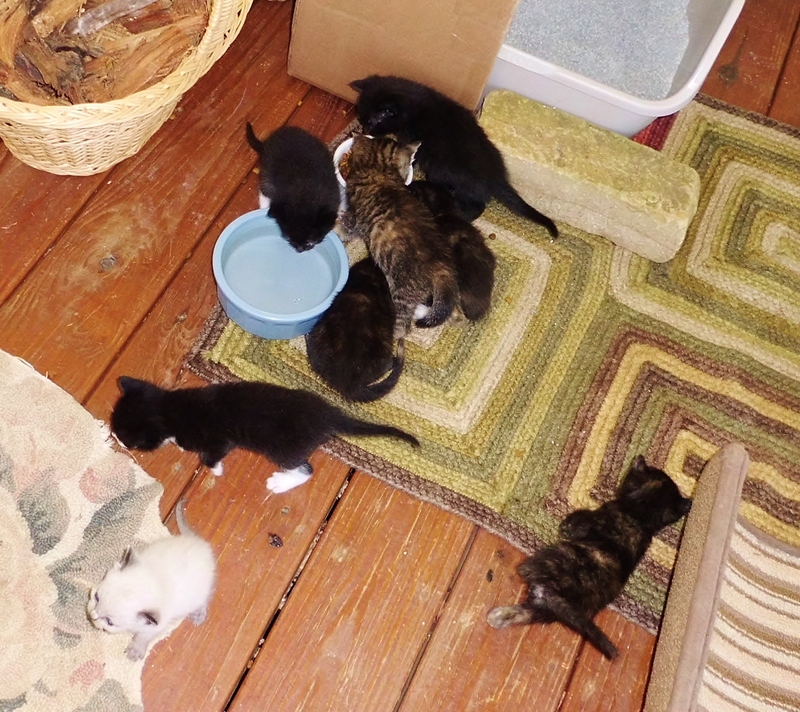 And for even more exciting news, (well it’s exciting to me) the kittens are starting to use the litter box! I saw evidence yesterday that someone other than Lori had used the facilities, and it was so cute I almost took a picture. Aren’t you glad I refrained? 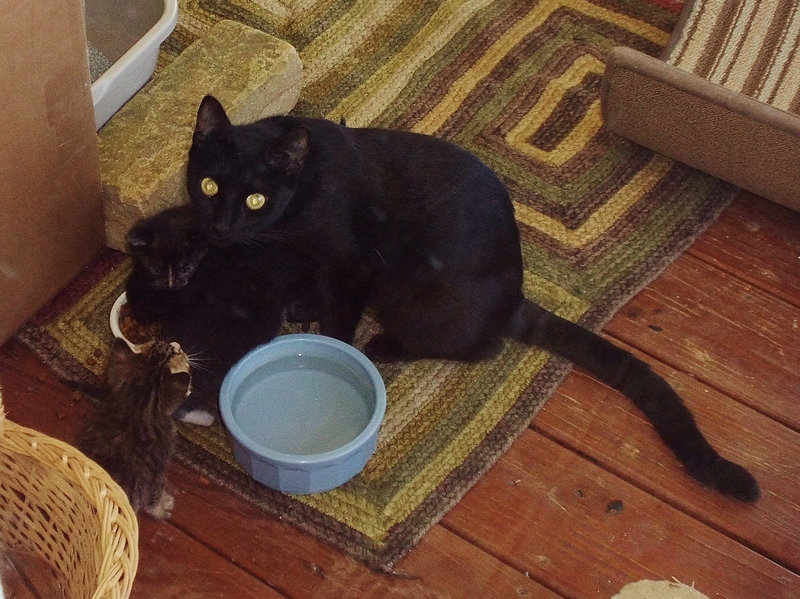 Our 23-year-old kitten came by this weekend to meet the babies. She was MUCH harder to potty train! We’re helping Mulder gain some weight by using a recipe from the Humane Shelter and a kitten baby bottle. 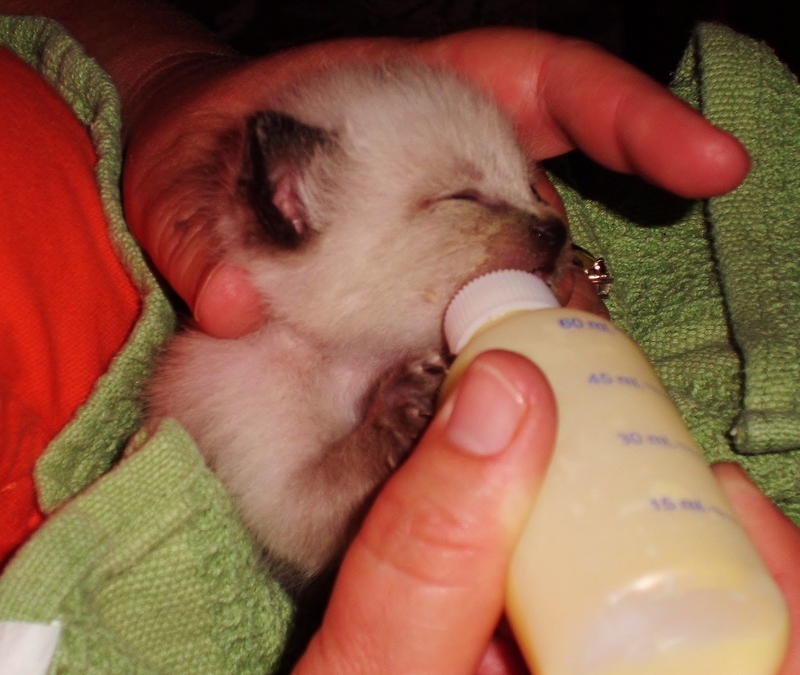 If you’ve never fed a kitten with a bottle, please come try it. I have two babies that I’m trying to fatten up other than Mulder and I only have two hands! 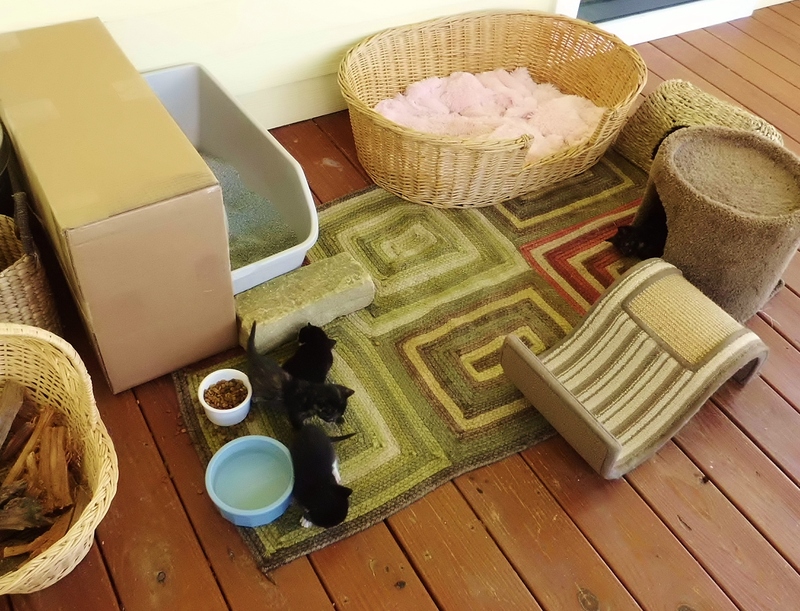 I’ve made a little playground for the kittens and they seem to really like it. At least once a day you can find them squeezed into a small kitty condo that Buster is loaning them for now. Come join us Buster! We'll make room. They’ve recently discovered the food and water too. 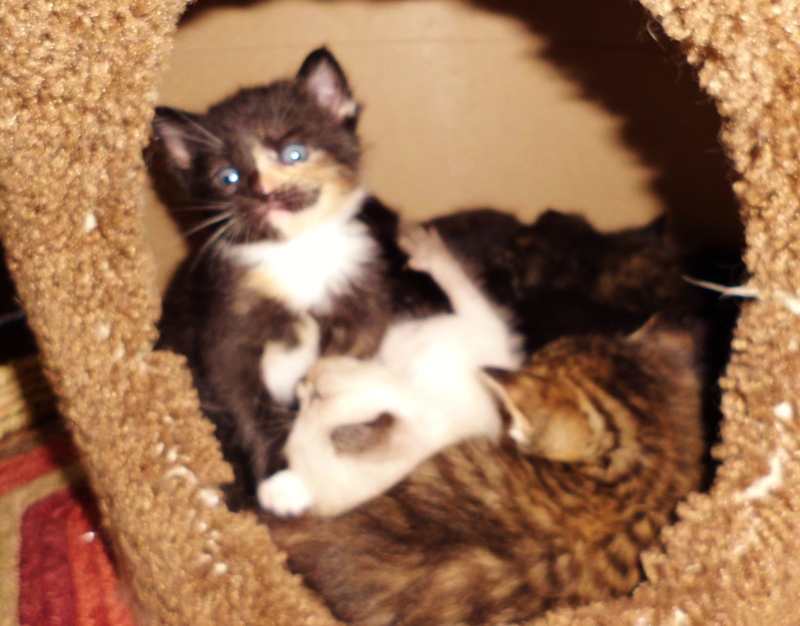 Poor Lori is now unable to escape her babies for some alone time now that they are mobile. The babies are four weeks old today. Come by soon to play with them. 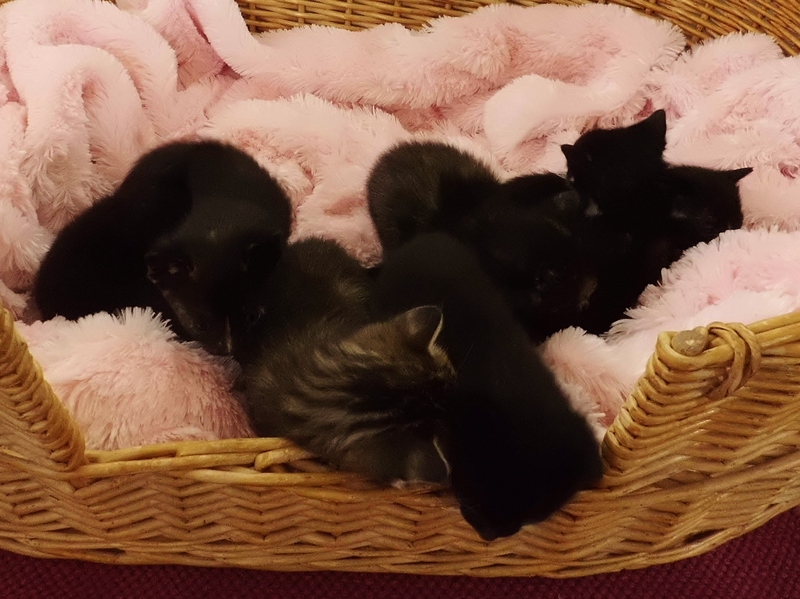 If I remember correctly from my last fostering experience, week four is officially the cutest kitten age! She wouldn’t wear anything I bought her. Not with a ten foot pole. OMG! Is that beautiful young lady my cousin? Gorgeous!